The Beneish M-Score is a checklist for identifying stocks that might be manipulating their earning figures. 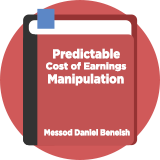 It was created by US finance Professor Messod Daniel Beneish and presented in a paper called The Predictable Cost of Earnings Manipulation. The M-Score is a red flag indicator that is often used as part of a short selling strategy. It calculates and distils eight different accounting variables into a single score. Generally, a score greater than -1.78 (i.e. a less negative or positive number) indicates an increased likelihood of a firm being an earnings manipulator. Beneish wrote: "We show that firms with a high probability of overstated earnings have lower future earnings, less persistent income-increasing accruals, and lower future returns." The M-score strategy apparently generated a hedged return of nearly 14% per year, mostly from the short positions. Professor of Accounting at the Kelley School of Business, Indiana University. In his "Detection of Earnings Manipulation" paper, Beneish found that the M-Score test could correctly identify 76% of manipulators, whilst only incorrectly identifying 17.5% of non-manipulators. In a subsequent 2007 paper - The Predictable Cost of Earnings Manipulation - Beneish examines the use of the M score as a stock selection technique (over the period 1993-2003). The M-score strategy apparently generated a hedged return of nearly 14% per annum.